本发明公开了一种信道估计的方法，包括：当第K条线路新加入到已有的K-1条线路的组合中时，在第K条线路上加载所述已有的K-1条线路的发送信号的组合；测量所述被加载所述信号的组合后的第K条线路的信噪比；根据所述已有的K-1条线路的发送信号的组合的系数和所述测量的信噪比，计算所述被加载所述信号的组合后的第K条线路的串扰信道。 The present invention discloses a method of channel estimation, comprising: when a new article K line added to the existing composition of the K-1 lines, the load on the existing K-th strip line K-1 a combination of transmission line signal; loaded by measuring the signal to noise ratio of the K-th line of the combined signal; combination coefficient according to the existing K-1 pieces of transmission signal lines and the measurement SNR calculating crosstalk channels of line K article after said combining said signal being loaded. 还公开一种信道估计的装置和系统，本发明不需要重新设计设备，而且测量时间短，精度高且有很好的鲁棒性。 Also disclosed apparatus and system for channel estimation, the present invention does not require re-design of the apparatus, and the measuring time is short, high accuracy and good robustness. 本发明涉及网络通信领域，具体地说，涉及一种信道估计的方法、设备和系统。  The present invention relates to network communication field, and more particularly, to a method of channel estimation, devices and systems. 数字用户线值SL)是一种W电话双绞线为传输介质的数据传输技术。  Digital Subscriber Line value SL) W is a telephone twisted pair data transmission technology transmission medium. X数字用户线（xDSL)作为该传输技术的组合，包括高速数字用户线（皿SL)、单线对高速数字用户线(S皿化)、非对称数字用户线（ADSL)等等。 X Digital Subscriber Line (xDSL) technology as a combination of the transmission, including high-speed digital subscriber line (SL dish), Single-pair High-speed Digital Subscriber Line (S of dish), Asymmetric Digital Subscriber Line (ADSL) and the like. 其中，除利用基带传输的甜D化等之外，采用通带传输的其它xD化利用频分复用技术，与传统电话业务（POT巧可共存于同一对双绞线上。 Wherein, in addition to D and so the use of sweet baseband transmission, the use of other xD passband transmission using frequency division multiplexing, and traditional telephone service (POT clever can coexist on the same twisted pair. 若向量预编码器能使HW为一对角矩阵，如diag化)，则可消除串扰。  If the vector pre-encoder can make HW is a diagonal matrix of such diag), the crosstalk can be eliminated. 为了消除串扰，必须先对信道进行估计，获得信道传输矩阵。 To cancel the crosstalk, channel must first estimate to obtain a channel transmission matrix. 现有技术中，是利用信号误差来对信道进行估计，要求设备必须能够提供信号误差。  In the prior art, is to estimate the channel, the device must be able to provide the required signal using the error signal error. 然而，许多网上运行的设备不支持该个功能，无法利用信号误差来估计信道，从而不能进行串扰抵消。 However, many of the online operation of the device does not support this function, it can not take advantage of the error signal to estimate the channel, and thus can not be crosstalk cancellation. 本发明实施例要解决的技术问题是：提供一种信道估计的方法、设备和系统，克服现有的信道估计技术要求设备必须能够提供信号误差的缺点。 Example Problem to be Solved  The present invention is: to provide a channel estimation method, apparatus and system to overcome existing technical requirements for channel estimation apparatus must be able to signal errors disadvantages. 为解决上述技术问题，本发明实施例提供一种信道估计的方法，包括：当第K条线路新加入已有的K-1条线路的向量组中时，在所述第K条线路上加载所述所述已有的K-1 条线路的发送信号的组合；测量加载了所述发送信号的组合的第K条线路的信噪比；根据所述已有的K-1条线路的发送信号的组合的系数和所述测量的信噪比，计算所述第K条线路的串扰信道。  To solve the above problems, embodiments provide a method of channel estimation according to the present invention, comprising: when the K-th vector set of new lines added to the existing K-1 lines, the article in the K composition K-1 line signal transmitting section of the line existing on the loading; measured SNR loaded article K line of the combined transmission signal; according to the existing K-1 section the combination coefficient of transmission signal lines and the measured SNR calculating the K-th line of the crosstalk channel. 计算单元，用于根据所述已有的K-1条线路的发送信号的组合的系数和所述接收的信噪比，计算所述第K条线路的串扰信道。  calculation unit according to a combination coefficient of the existing K-1 pieces of transmission signal lines and the received SNR calculating the K-th line of the crosstalk channel. 发送单元，用于发送所述测量的信噪比至所述联合收发设备。  The transmitting unit to noise ratio for the transceiver device transmits the combined measurement. 接收单元，用于接收所述对端设备计算的所述加载了所述信号的组合的第K条线路的串扰信道。  a receiving unit, for receiving the end of the computing device loaded crosstalk channels article K line of said combined signal. 发送单元，用于发送所述计算的串扰信道至所述联合收发设备。  The sending unit, configured to send the calculated crosstalk channels to said combined transmitter and receiver. 由上述本发明实施例提供的技术方案可W看出，本发明提供一种信道估计的方法、设备和系统，利用现网的设备能提供信噪比（SNR)参数的特点，通过测量的SNR参数和加载的其他线路的发送信号的组合计算出线路的串扰特性。  The technical solution provided by the embodiment of the present invention W may be seen, the present invention provides a method, apparatus and system for channel estimation, using the existing network device can provide the characteristics of SNR (SNR) parameters, by combined SNR measurements and other parameters of the transmission signal calculated line load characteristic line crosstalk. 本发明实施例提供的技术方案，不需要重新设计设备，而且测量时间短，精度高且有很好的鲁棒性。 Technical solutions provided by the embodiments of the present invention, without redesigning equipment, but the measuring time is short, high accuracy and good robustness. 图6为本发明实施例H的联合收发设备的加载单元的结构示意图。  FIG. 6 is a schematic view of the loading unit of embodiment H combined transceiver embodiment of the invention. 本发明实施例，既可W适用于新用户上线时估计串扰信道，也可W适用于对串扰信道进行跟踪等场景。  Example embodiments of the present invention, when the estimated crosstalk channel W applied to both new users on line, can also be applied to W channel crosstalk scene tracking. W下均W新用户加入向量组（vector group)为例进行说明。 W W are the new user joins the group of vectors (vector group) as an example. 假设在一个向量组中已有K-1条线路，当第K条新线路要求加入该个向量组时，可W通过第K条线路上测量的信噪比（SNR)来估计出其他K-1条线路分别对第K条线路的串扰。 Assuming a vector group already lines K-1, K article when added to the new line in claim vectors group, W may be by ratio (SNR) measured at the K-th line to the estimated other K- a line crosstalk respectively to the article K line. 该步骤具体为联合收发设备在线路K的下行方向的某个子频带上，同时注入线路1至线路K-1的发送信号的全部或部分信号的组合。  This step is a particular transceiver in a combined sub-band in the downlink direction of line K, while injecting a combination of all or part of the signal K-1 to a line transmission signal line. 加载了哪些线路的信号，哪些线路对第K条线路的串扰就能被本发明实施例计算出来。 Which loading of signal lines, which lines crosstalk article K line can be calculated according to the present embodiment of the invention. 各个子频带上是并列进行上述处理的。 The above-described processing is performed in parallel on each subband. 林'、(/)二矿、(/)，Vi<K. Lin ', (/) two ore, (/), Vi <K. 组合系数的绝对值的平方和为1，是本发明的一个优选实施例，还可为其它系数。 And the square of the absolute value of  combining coefficients 1, it is a preferred embodiment of the present invention, but also for the other coefficients. 其中，表示在第i条线路上的发送功率（联合收发设备已知各条线路的发送功率）；没Wf表示第K条线路在未被加载信号时接收端的信噪比。  where it represents the i-th line of the transmission power (power transmission joint is known transceiver device of each line); Wf represents no article K line when not receiving end load signal to noise ratio. 该步骤具体为对端设备测量线路K的下行方向的上述相同子频带上的信噪比，信噪比是直接测量得到的。  The particular step is the same signal to noise ratio on the downlink subband-direction end of the apparatus for measuring the line K, the signal to noise ratio is measured directly. 步骤103 ;根据其它线路的发送信号的组合的系数和测量的信噪比，计算被加载线路的串扰信道。  Step 103; The combination coefficient and the measured transmission signal to noise ratio of the other line, the line is loaded calculate crosstalk channels. 该步骤具体为联合收发设备根据对端设备反馈的线路K被加载后的信噪比和其它线路的发送信号的组合的系数计算线路K的串扰信道；或者为联合收发设备将其它线路的发送信号的组合的系数发送至对端设备，对端设备根据测量的线路K被加载后的信噪比和接收的其它线路的发送信号的组合的系数计算线路K的串扰信道。  This step specifically for the joint line transceiver device calculates the combined coefficient K based on the SNR of the remote device feedback line K is loaded and the other transmission signal line crosstalk channels; or a combined transceiver to the other lines coefficients combined transmission signal is transmitted to the peer device calculates the crosstalk channels of line K coefficient combinations of other transmission signals and the received SNR line after the end of the device is loaded in accordance with the line K measured. 其中，為表示背景噪声的功率。  where, is a background noise power. I 否+ 沛。  I NO + Pei. '|:=闷|2 +|£护。 '|: = Nausea | 2 + | £ protection. |: +2^ bW 甘a. |: + 2 ^ bW Gan a. 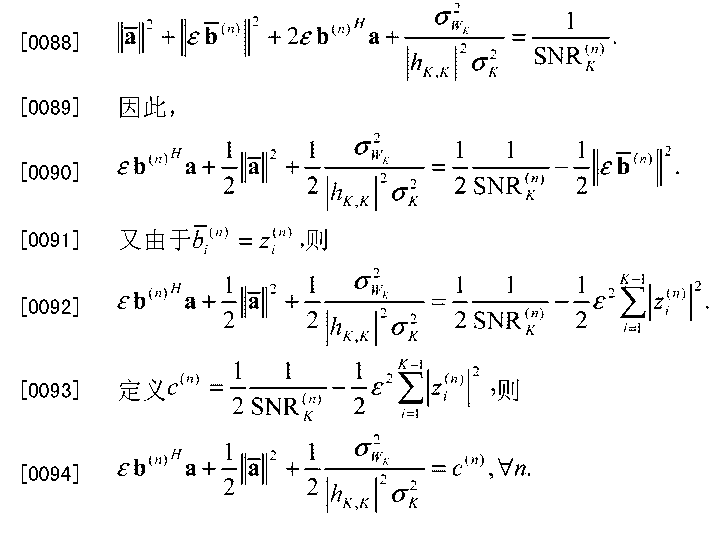 它作为SNR的组合矩阵，有打《  The matrix composition as SNR, some playing "
 e PBa = Pc. e PBa = Pc. 选择合适的组合矩阵，根据各条线路上的发送信号的组合的系数，计算G = pinv(PB)P;根据各条线路上的发送信号的组合的系数和测量的SNR，计算C树二臺奋去而-去€2钟,叫；;根据上述计算结果，计算a = e -iGc ;最后，得出经直接信道h..- 归一化的串扰信道^ = A +知KW，所-。  select the appropriate combination of the matrix, a coefficient combination of the transmission signals on the respective lines, calculates G = pinv (PB) P; The coefficients and the measured combination of transmission signals on the lines the SNR, calculated for C two sets to the tree Fen - € to 2 minutes, based on the calculation result is called ;; calculating a = e -iGc; Finally, derived by direct channel h ..- normalized crosstalk channels known KW ^ = a + , the -. e PBa 二化. e PBa of the two. 其中，pinv(. )表示伪逆操作。  where, pinv (.) Indicates a pseudo-inverse operation. 矩阵乘积的伪逆。 Pseudo-inverse matrices. 在算法中的G矩阵可W直接通过矩阵P获得。 G matrix W algorithm may be obtained directly by a matrix P. 如下式。 The following equation. 该样可W降低算法的运算复杂度。 The sample W can reduce the computational complexity of the algorithm. [015引另外，如果用户的数量是2的n次方的话，我们可W选择Walsh-Hadamard序列来生成矩阵B。 [015 cited Further, if the number of users is n-th power of 2, we can select the Walsh-Hadamard sequence W to generate matrix B. 该样的另一个好处是由于Walsh-Hadamard序列是有正负一构成，计算过程中的乘法就可W用简单的加减法来代替。 Another advantage of this kind is due to the Walsh-Hadamard sequence is composed of a positive and negative, multiplication calculation process W can be used in place of the simple subtraction. 当然只要满足本方法要求的任意矩阵B都可W正确的计算出信道矩阵，本方法并不限于上述的选择方法。 Of course, as long as the requirements of the method of any matrix W B can correctly calculate the channel matrix, the present method is not limited to the above selection method. 利用不同的组合系数，重复步骤101和步骤102应不少于2K-1次，才能计算出所有其他K-1条线路对第K条线路的串扰。  using different combinations of coefficients, repeating steps 101 and 102 should be less than 2K-1 times to calculate all the other K-1 lines to crosstalk article K line. 上述重复步骤101和步骤102的次数，是根据加载的其他线路的个数（即要测量的串扰的个数）决定的。 The number of the repeating steps 101 and 102 is (i.e., the number of crosstalk to be measured) according to the number of other loaded lines determined. 上述整个过程可W重复多次，不断更新串扰信道，重复的目的是为了提高精度或是进行线路跟踪。  The whole process can be repeated many times W, crosstalk channels constantly updated, repetitive purpose is to improve the accuracy for line or track. [016引其中，offdiag 狂）=X-diag 狂）. [Wherein lead 016, offdiag mad) = X-diag mad). 本实施例提供的信道估计的方法，通过测量的被加载线路的SNR参数和加载的其它线路的发送信号的组合，计算被加载线路的串扰特性。 Method  The present embodiments provide channel estimation, the parameters are loaded by the combined SNR measured line and other lines of the transmission signal is loaded, calculating crosstalk characteristic line is loaded. 本实施例不需要重新设计设备，而且测量时间短，精度高且有很好的鲁棒性。 The present embodiment does not require re-design of the apparatus, and the measurement time is short, high accuracy and good robustness. 如图3所示为本发明实施例二信道估计的系统示意图，该系统至少包括联合收发设备1和对端设备2。  As shown in Figure 3 present a schematic diagram of the system according to the second embodiment of the invention, channel estimation, the system comprising at least a transceiver device 1 and 2 combined peer device. 其中，联合收发设备1包括；加载单元11，接收单元12和计算单元13。  wherein the joint comprises a transceiver; loading unit 11, receiving unit 12 and calculation unit 13. 加载单元11，用于在信道的一条线路上加载其它线路的发送信号的组合；接收单元12,用于接收对端设备测量的被加载线路的信噪比；计算单元13,用于根据其它线路的发送信号的组合的系数和接收的信噪比，计算被加载线路的串扰信道。 Loading unit 11 for loading a combination of signals sent on other lines in a line of a channel; receiving unit 12, for receiving the signal to noise ratio of the loaded line-side device measured; calculation unit 13, according to the other lines coefficients combined transmission signal and the received signal to noise ratio, calculating crosstalk channels of the loaded line. 相应地，对端设备2包括测量单元21，发送单元22。  Accordingly, 21, transmitting unit 22 side device 2 includes a measuring unit. 测量单元21，用于测量所述被加载线路的信噪比；发送单元22,用于发送测量的信噪比至联合收发设备。 Measuring means 21 for measuring the SNR of the loaded line; and a sending unit 22, configured to send the measured SNR to a combined transmitter and receiver. [016引如图4所示为本实施例联合收发设备的加载单元的结构示意图。 Schematic structural diagram of a transceiver shown in 4 cases of combined loading unit embodiment of the apparatus [016 introduced in FIG. 联合收发设备的加载单元11可W进一步包括；第一计算单元111和第一加载单元112。 The combined transceiver loading unit 11 may further comprise W; a first calculation unit 111 and a first loading unit 112. 第一计算单元111， 用于计算其它线路的发送信号的组合与步长的乘积；第一加载单元112,用于在被加载线路上加载其它线路的发送信号的组合与步长的乘积。 The first calculation unit 111, used in combination with the step size calculated from the product line of the other transmission signal; a first loading unit 112 for loading the product of step size in combination with the other transmission line signals on the line is loaded. 发送功率和被加载线路未被加载时的信噪比计算步长。 SNR and transmission power line is not loaded are loaded calculation step. 本实施例联合收发设备的计算单元13,还用于根据步长和各条线路的发送功率， 计算被加载线路的串扰信道。  Example embodiment of the present calculation unit 13 combined the transceiver device is further configured according to the step and the transmit power of each line, the line is loaded calculate crosstalk channels. [017。 [017. 本实施例提供的信道估计的系统和设备，通过测量的被加载线路的SNR参数和加载的其它线路的发送信号的组合，计算被加载线路的串扰特性。 Channel estimates provided by the present embodiment of the system and apparatus, the parameters are loaded by the combined SNR measurement circuit and other signal transmission line load, calculating crosstalk characteristic line is loaded. 本实施例不需要重新设计设备，而且测量时间短，精度高且有很好的鲁棒性。 The present embodiment does not require re-design of the apparatus, and the measurement time is short, high accuracy and good robustness. 如图5所示为本发明实施例H信道估计的系统示意图。  FIG embodiment of the present invention is a system diagram embodiment of a channel estimation H 5. 该系统至少包括联合收发设备3和对端设备4。 The system includes at least a transceiver device 3 and the joint end of the device 4. 其中，联合收发设备3包括；加载单元31，发送单元32和接收单元33。  wherein the joint comprises a transceiver 3; loading unit 31, transmitting unit 32 and receiving unit 33. 加载单元31，用于在信道的一条线路上加载其它线路的发送信号的组合；发送单元32,用于发送所述其它线路的发送信号的组合的系数至对端设备；接收单元33,用于接收对端设备计算的被加载线路的串扰信道。 Loading unit 31 for loading a combination of other signals transmitted on a line in the line channel; a transmission unit 32, the transmission coefficient of the combined transmission signal to the other lines for the peer device; a receiving unit 33, for receiving the crosstalk channels of the loaded line of the peer computing device. 相应地，对端设备4包括；测量单元41，接收单元42,计算单元43和发送单元44。  Accordingly, the peer device 4 comprises; a measuring unit 41, receiving unit 42, calculation unit 43 and transmission unit 44. 测量单元41，用于测量被加载线路的信噪比；接收单元42,用于接收联合收发设备发送的其它线路的发送信号的组合的系数；计算单元43,用于根据其它线路的发送信号的组合的系数和测量的信噪比，计算被加载线路的串扰信道；发送单元44,用于发送计算的串扰信道至联合收发设备。 A measuring unit 41 for measuring the SNR of the loaded line; a receiving unit 42, a combination of the coefficient of transmission signal lines receiving the other joint transceiver transmitting device; calculating unit 43, according to other lines of the transmission signal SNR measurement and combination coefficients, calculating crosstalk channels loaded line; sending unit 44, configured to send the calculated crosstalk channels to a combined transmitter and receiver. 如图6所示为本实施例联合收发设备的加载单元的结构示意图。  FIG schematic structural diagram of a transceiver apparatus combined loading unit of the present embodiment shown in FIG 6. 联合收发设备的加载单元31可W进一步包括；第一计算单元311和第一加载单元312。 The combined transceiver loading unit 31 may further comprise W; a first calculating unit 311 and a first loading unit 312. 第一计算单元311， 用于计算其它线路的发送信号的组合与步长的乘积；第一加载单元312,用于在被加载线路上加载其它线路的发送信号的组合与步长的乘积。 A first calculation unit 311, used in combination with the step size calculated from the product line of the other transmission signal; a first loading unit 312 for loading the product of step size in combination with the other transmission line signals on the line is loaded. 第一计算单元311还可W进一步包括；第二计算单元3111，用于根据各条线路的发送功率和被加载线路未被加载时的信噪比计算步长。  The first calculating unit 311 may further comprise W; second calculating means 3111 for calculating the step size when the transmit power of signal to noise ratio of each line and the load line is not loaded. 本实施例联合收发设备3的发送单元32,还用于发送步长和各条线路的发送功率至对端设备。 Transmission unit 3 according to Embodiment combined transceiver  32 present further configured to send the step and transmit power of each line to the peer device. 相应地，本实施例对端设备4的接收单元42,还用于接收联合收发设备发送的步长和各条线路的发送功率；计算单元43,还用于根据接收的步长和各条线路的发送功率， 计算被加载线路的串扰信道。  Accordingly, the present embodiment of the receiving unit 4 of the terminal device 42, the step of jointly transmitting transceiver and the transmission power of each line for receiving further; calculation unit 43, also according to the received step and transmission power of each of the lines, the line is loaded calculate crosstalk channels. 本实施例提供的信道估计的系统和设备，通过测量的被加载线路的SNR参数和加载的其它线路的发送信号的组合，计算被加载线路的串扰特性。  The present embodiment provides a channel estimation system and apparatus, by combining the transmission signals of other lines is loaded and the SNR of the loaded line parameters measured, calculated crosstalk characteristic of the line is loaded. 本实施例不需要重新设计设备，而且测量时间短，精度高且有很好的鲁棒性。 The present embodiment does not require re-design of the apparatus, and the measurement time is short, high accuracy and good robustness. W上所述，仅为本发明较佳的具体实施方式，但本发明的保护范围并不局限于此， 任何熟悉本技术领域的技术人员在本发明掲露的技术范围内，可轻易想到的变化或替换， 都应涵盖在本发明的保护范围之内。  On the W, the present invention is merely preferred specific embodiments, but the scope of the present invention is not limited within this, any skilled in the art in the art in the technology of the present invention is exposed kei range, changes or replacements readily occur, shall fall within the protection scope of the present invention. 因此，本发明的保护范围应该W权利要求的保护范围为准。 Accordingly, the scope of the present invention W scope of the claims should prevail. 1. 一种信道估计的方法，其特征在于，包括： 当第K条线路新加入已有的KI条线路的向量组时，在所述第K条线路上加载所述已有的KI条线路的发送信号的组合； 测量加载了所述发送信号的组合的第K条线路的信噪比； 根据所述已有的KI条线路的发送信号的组合的系数和所述测量的信噪比，计算所述第K条线路的串扰信道。 1. A method of channel estimation, characterized by comprising: when a new line is added K-th vector set existing lines of KI, KI loading the existing lines in the K-th line combined transmission signal; loaded article K measured SNR of the transmission line of the combined signal; combined transmission signals based on the coefficients of the existing lines KI and the measured signal to noise ratio, calculating a K-th line of the crosstalk channel. 2. 如权利要求1所述的一种信道估计的方法，其特征在于，在所述第K条线路上加载所述已有的KI条线路的发送信号的组合，具体包括：根据公式Xinl(Z) =Sr(ZHstizfW),在第K条线路的发送信号上添加已有的第1到第KI条线Z=I 路的发送信号的组合，其中，ε为步长，为在第η个SNR测量期间第i条线路的组合系数，为在第η个SNR测量期间第i条线路上的第1个符号所需发送的信号，χ^/；)为第K条线路上实际发送的信号。 A channel 2. The method according to claim 1 estimates, wherein the load combination of transmission signals KI lines existing on the K-th line, comprises: according to formula Xinl ( Z) = Sr (ZHstizfW), was added a combination of transmission signals has a first section line Z = I KI to the passage on the line K-th transmission signal, wherein, in steps [epsilon], to a first η combination coefficient i-th line during SNR measurement, the signal is in the first η i th line during a first SNR measurement desired symbol transmitted, χ ^ /;) is a signal actually transmitted on the line K-th . 4. 如权利要求2所述的一种信道估计的方法，其特征在于，所述ε满足ε=nVnl^5A^(〇) 其中，4:表示在第i条线路上的发送功率；表示第k条线路在未被加载信号时接收端的信噪比。 4. 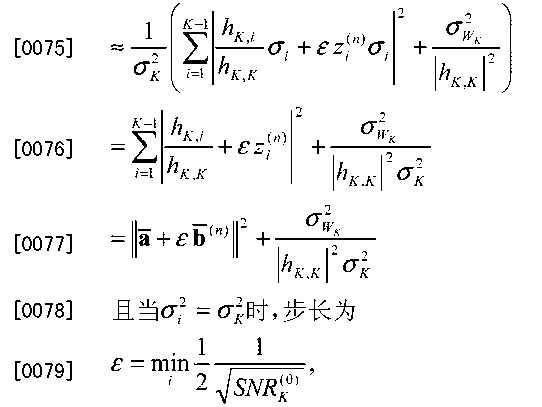 The method of channel estimation according to claim 2, characterized in that the [epsilon] satisfies ε = nVnl ^ 5A ^ (square) where 4: represents transmission power in the i-th line; represents k lines SNR at the receiving end the signal is not loaded. 5. 如权利要求2所述的一种信道估计的方法，所述ε被设置为一个值，使得在加载了发送信号的组合后第K条线路的接收端SNR降低值不大于3. 5dB。 A channel 5. 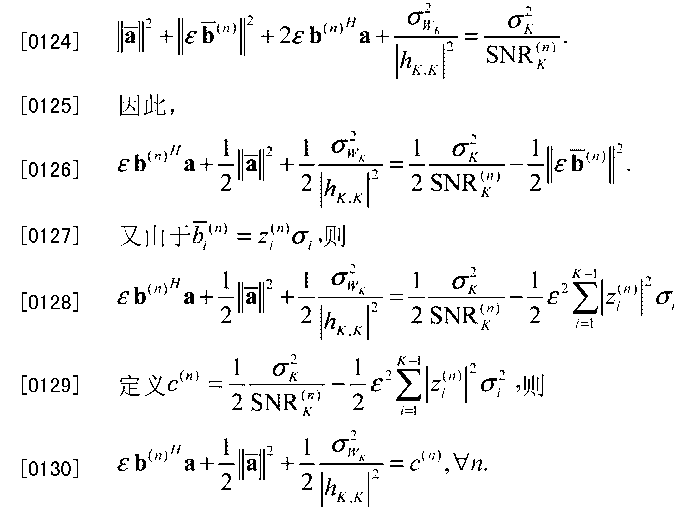 The method according to claim 2 estimates, the ε is set to a value such that after loading a combination of transmission signals receiving end SNR decreases article K line is not greater than 3. 5dB. 6. 如权利要求1到5任一项所述的一种信道估计的方法，其特征在于，所述第K条线路的串扰信道为经所述第K条线路的直接信道归一化的串扰信道。 6. The method of any of 1-5 A channel estimation of one of the preceding claims, wherein the crosstalk channels of the K-th line is a direct channel through said K-th line is normalized crosstalk channel. 7. -种联合收发设备，其特征在于，包括： 加载单元，用于在第K条线路上加载已有的KI条线路的发送信号的组合；所述第K条线路为新加入的线路； 接收单元，用于接收对端设备测量的所述加载了所述发送信号的组合的第K条线路的信噪比； 计算单元，用于根据所述已有的KI条线路的发送信号的组合的系数和所述接收的信噪比，计算所述第K条线路的串扰信道。 7. - kind of combined transceiver, characterized by comprising: a loading unit configured to load a combination of signals sent on the existing K-th line KI lines; said K-th line is a line newly added; receiving means for receiving the end loading device measures the SNR of the K-th transmission lines combined signal; calculating means, for transmitting a signal according to a combination of the existing lines of KI coefficients and the received signal to noise ratio, calculating a K-th line of the crosstalk channel. 8. 如权利要求7所述的一种联合收发设备，其特征在于，所述加载单元包括： 第一计算单元，用于计算所述已有的KI条线路的发送信号的组合与步长的乘积； 第一加载单元，用于在所述第K条线路上加载所述已有的KI条线路的发送信号的组合与所述步长的乘积。 8. A combined transceiver apparatus according to claim 7, wherein the loading unit comprises: a first calculating means for calculating a step in combination with the existing transmission signal KI strip line length product; a first loading means for loading the combined length of the transmission signal KI existing lines with the product of step in the K-th line. 9. 如权利要求8所述的一种联合收发设备，其特征在于，所述第一计算单元进一步包括： 第二计算单元，用于根据各条线路的发送功率和所述第K条线路在未被加载所述发送信号的组合时的信噪比计算所述步长。 9. A combined transceiver apparatus according to claim 8, wherein the first calculating unit further comprises: a second calculating unit for the transmission power of each line and the line K-th the unloaded when the transmission of the combined signal to noise ratio calculating step. 10. 如权利要求9所述的一种联合收发设备，其特征在于，所述计算单元，还用于根据所述步长和所述各条线路的发送功率，计算所述第K条线路的串扰信道。 10. A combined transceiver apparatus according to claim 9, wherein said calculation unit further configured to transmit the power and the step size of each line, calculating the K-th line crosstalk channel. 11. 一种信道估计的系统，其特征在于，包括：联合收发设备和对端设备； 所述联合收发设备包括： 加载单元，用于在第K条线路上加载已有的KI条线路的发送信号的组合；所述第K条线路为新加入的线路； 接收单元，用于接收对端设备测量的所述加载了所述发送信号的组合的第K条线路的信噪比； 计算单元，用于根据所述已有的KI条线路的发送信号的组合的系数和所述接收的信噪比，计算所述第K条线路的串扰信道； 所述对端设备，包括： 测量单元，用于测量所述加载了所述发送信号的组合的第K条线路的信噪比； 发送单元，用于发送所述测量的信噪比至所述联合收发设备。 11. A channel estimation system, comprising: a transceiver device and a joint end of the device; and the combined transmitting and receiving apparatus comprising: a loading unit, configured to send an existing load on the line K-th lines of KI combined signal; said K-th line is a newly added line; receiving means for receiving the terminal apparatus measures the SNR of the loaded line K-th transmission of the combined signal; calculating means, the coefficients for the combination of the existing signal transmission lines KI and the received signal to noise ratio, calculating the crosstalk channels of line K article; the peer apparatus, comprising: a measuring unit, with measuring the load on the signal to noise ratio of the K-th transmission lines of the combined signal; transmitting means to signal to noise ratio for the transceiver device transmits the combined measurement. 12. 如权利要求11所述的一种信道估计的系统，其特征在于，所述计算单元，还用于根据步长和各条线路的发送功率，计算所述第K条线路的串扰信道。 12. A channel system according to claim 11 estimates, wherein the calculation unit is further configured according to the step and the transmit power of each line, calculating the K-th line of the crosstalk channel. 13.-种联合收发设备，其特征在于，包括： 加载单元，用于在第K条线路上加载已有的KI条线路的发送信号的组合；所述第K条线路为新加入的线路； 发送单元，用于发送所述已有的KI条线路的发送信号的组合的系数至对端设备； 接收单元，用于接收所述对端设备计算的所述加载了所述发送信号的组合的第K条线路的串扰信道。 13.- Joint species transceiver, characterized by comprising: a loading unit configured to load a combination of signals sent on the existing K-th line KI lines; said K-th line is a line newly added; transmission means for the combined coefficient KI conventional strip line transmission signal is transmitted to the peer device; receiving means for receiving the end of the computing device loaded with a combination of the transmitted signal section K crosstalk channel lines. 14. 如权利要求13所述的一种联合收发设备，其特征在于，所述加载单元包括： 第一计算单元，用于计算所述已有的KI条线路的发送信号的组合与步长的乘积； 第一加载单元，用于在所述第K条线路上加载所述已有的KI条线路的发送信号的组合与所述步长的乘积。 14. A combined transceiver apparatus according to claim 13, wherein the loading unit comprises: a first calculating means for calculating a step in combination with the existing transmission signal KI strip line length product; a first loading means for loading the combined length of the transmission signal KI existing lines with the product of step in the K-th line. 15. 如权利要求14所述的一种联合收发设备，其特征在于，所述第一计算单元进一步包括： 第二计算单元，用于根据各条线路的发送功率和所述第K条线路在未被加载所述发送信号的组合时的信噪比计算所述步长。 15. A combined transceiver apparatus according to claim 14, wherein the first calculating unit further comprises: a second calculating unit for the transmission power of each line and the line K-th the unloaded when the transmission of the combined signal to noise ratio calculating step. 16. 如权利要求15所述的一种联合收发设备，其特征在于，所述发送单元，还用于发送所述步长和所述各条线路的发送功率至所述对端设备。 16. A combined transceiver apparatus according to claim 15, wherein the sending unit is further configured to transmit the transmission power and the step size of each line to the peer device. 17.-种信道估计的系统，其特征在于，包括：联合收发设备和对端设备； 所述联合收发设备包括： 加载单元，用于在第K条线路上加载已有的KI条线路的发送信号的组合；所述第K条线路为新加入的线路； 发送单元，用于发送所述已有的KI条线路的发送信号的组合的系数至对端设备； 接收单元，用于接收所述对端设备计算的所述加载了所述发送信号的组合的第K条线路的串扰信道； 所述对端设备，包括： 测量单元，用于测量所述第K条线路的信噪比； 接收单元，用于接收所述联合收发设备发送的所述已有的KI条线路的发送信号的组合的系数； 计算单元，用于根据所述已有的KI条线路的发送信号的组合的系数和所述测量的信噪比，计算所述第K条线路的串扰信道； 发送单元，用于发送所述计算的串扰信道至所述联合收发设备。 17.- type of channel estimation system, characterized by comprising: a transceiver device and a joint peer device; the combined transmitting and receiving apparatus comprising: a loading unit, configured to send an existing load on the line K-th lines of KI combined signal; said K-th line is a newly added line; transmitting means for transmitting the coefficients of the combined signal prior to transmission lines of KI to the peer device; receiving means for receiving the the peer computing device loads the crosstalk channels of line K-th of the transmission of the combined signal; the peer apparatus, comprising: a measuring unit for measuring the signal to noise ratio of the K-th line; receiving means for receiving said combination coefficient transceiver transmitting said combined apparatus KI conventional signal transmission lines; calculating unit, a coefficient for the combined signal of the existing transmission lines and KI the measured signal to noise ratio, calculating the crosstalk channels of line K article; transmitting means for transmitting the calculated crosstalk channels to said combined transmitter and receiver. 18.如权利要求17所述的一种信道估计的系统，其特征在于，所述联合收发设备的发送单元，还用于发送步长和各条线路的发送功率至所述对端设备； 所述对端设备的计算单元，还用于根据所述步长和所述各条线路的发送功率，计算所述第K条线路的串扰信道。 18. A channel system according to claim 17 estimates, wherein said transmitting apparatus combined transceiver unit is further configured to send the step and transmit power to the terminal apparatus of each line; the said computing unit end device, according to the further steps and the transmit power of each line, calculating the K-th line of the crosstalk channel.